All TEMV members and their friends are encouraged to attend the fun and engaging URJ Shabbaton on March 25, for an uplifting Shabbat service, speakers, workshops, and a chance to meet other congregants and leaders from our region. 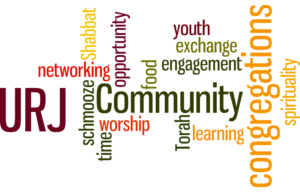 Join us for an uplifting Shabbat that incorporates something for everyone—Torah study, worship, lunch, learning and music will all be offered with time to connect and network. Additionally, Temple Beth-El is offering participants the chance to partake in a “spirited” Havdalah service known as *Shabbatini ending at 7:30pm (Note: there is a small additional cost for this on the registration site). Rabbi David Ellenson, Chancellor Emeritus of Hebrew Union College-Jewish Institute of Religion, delivering our keynote address: Lessons for the future: What Two Great Reform Leaders of the Past Can Teach Us Today during our lunch! Gila Hadani Ward, Union for Reform Judaism Director of Lay Resources who will offer two dynamic workshops: Beyond Survey Monkey: Listening to Our Congregants… and The Next Step: Really Getting Relational…both of which will be dynamic and impactful! Confirmed workshops include: Racial Justice and Criminal Justice Reform, how synagogues act powerfully locally, Urgency of Now, how synagogues can acct in the new political landscape, Wise Aging, Multiple Platforms—social media: the many places and spaces to meet, and others are in the planning process. Register here and visit the event page for further details.